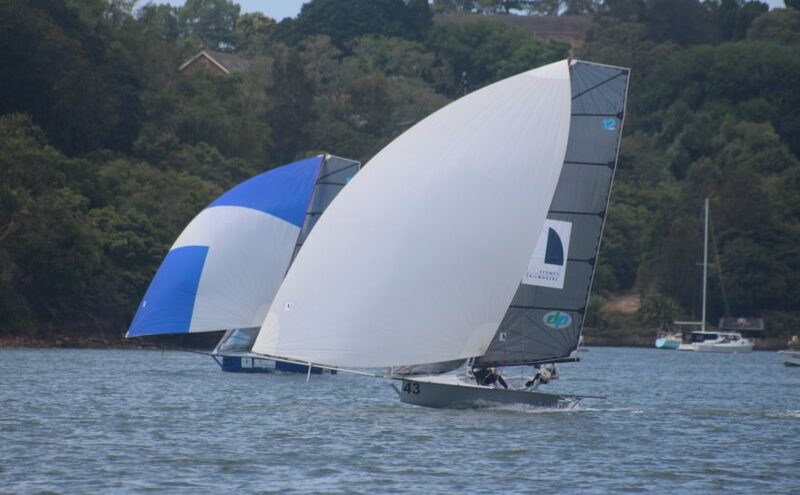 The 12ft Skiff fleet turned out to compete for the 12ft Sprint Series Championship hosted by Abbotsford 12ft Flying Squadron, the first real hit out for most Skiffs since the Interdominion. The +35-degree day resembling the Brisbane rigging park with even a few XXXX’s drunk to really get the QLD vibe happening. Big rigs were the order of the day as a light North Easter filtered down the Parramatta river, Geotherm (Brett Hobson/Bill Lusty) and Lincoln Crowne (Jonathon Temple/Richard Jones) won the first start. 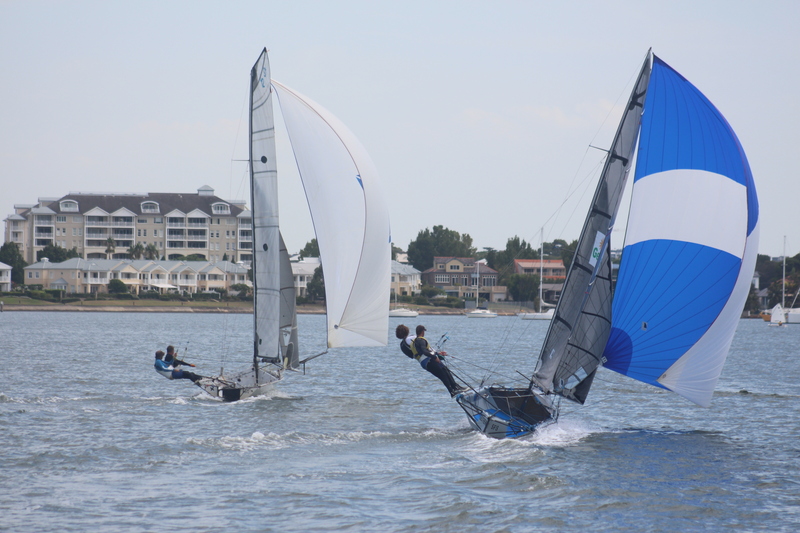 The tight river course means plenty of close calls and tacks to the top mark. 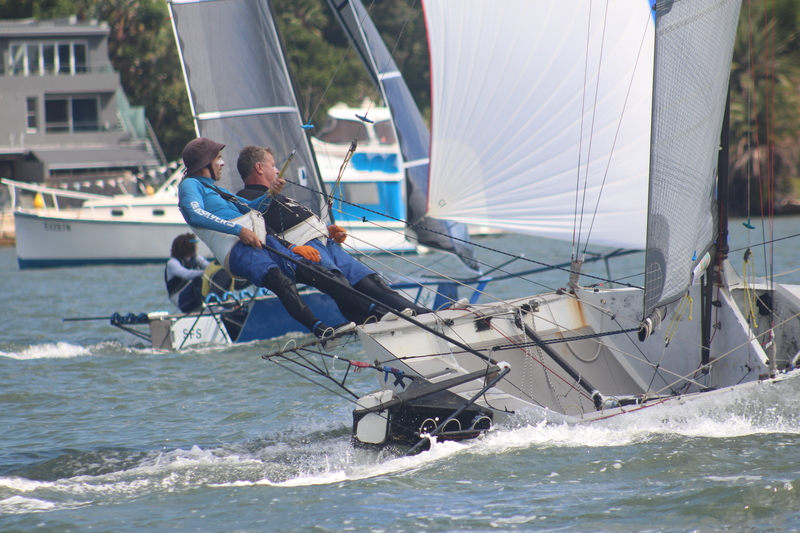 Geotherm held a narrow lead over Sydney Sailmakers (Nick Press and Andrew ‘Noddy’ Hay) with Lincoln Crowne in 3rd. 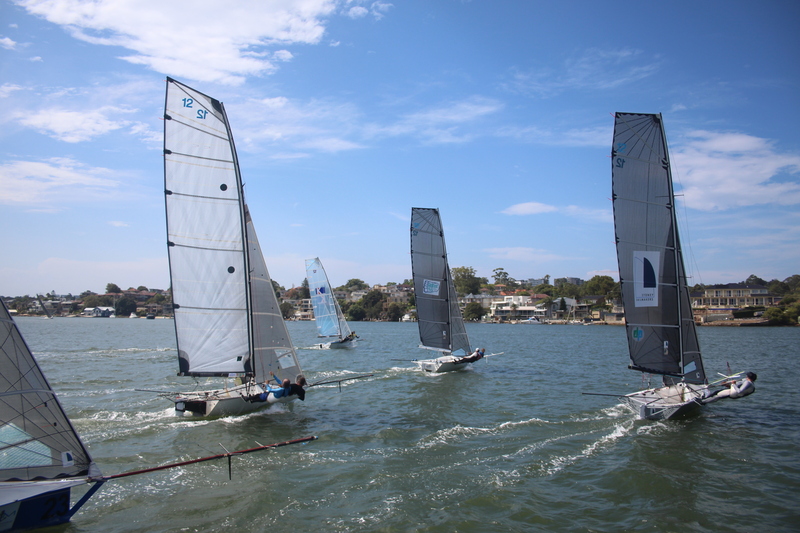 Sydney Sailmakers gybed inside Geotherm at the top mark to grab the lead down the run and maintained the lead throughout the race. Lincoln Crown and Geotherm locked into a battle for 2nd position for the rest of the race with Geotherm only re gaining the 2nd spot on the last tack to the finish. 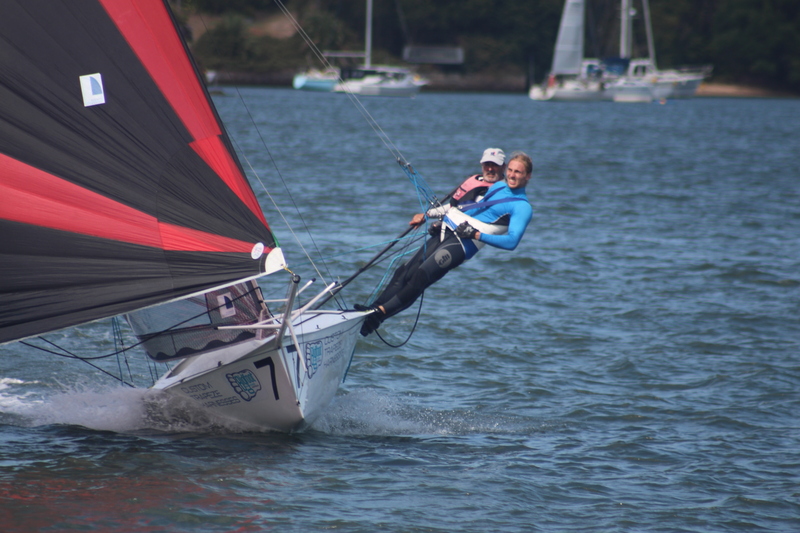 Bigfoot Foot Custom Trapeze Harnesses (Murray Press/Macca Patton) held off a fast finishing Chapman High Performance Sailing (Jack Winning/Brett Phillips) for 4th place. Race 2 go underway with the breeze having built slightly to make it a very comfortably big sail. Bigfoot and Havoc (Ben Faulkner/Renn Holland) got the best of the start racing toward the river club. 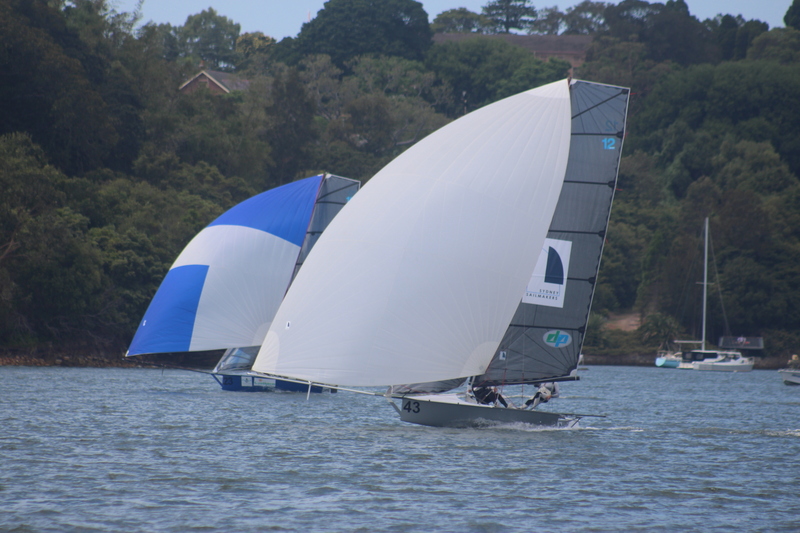 Sydney Sailmakers fought hard with Geotherm up the first work to pull in the leading skiffs and lead around the top mark. 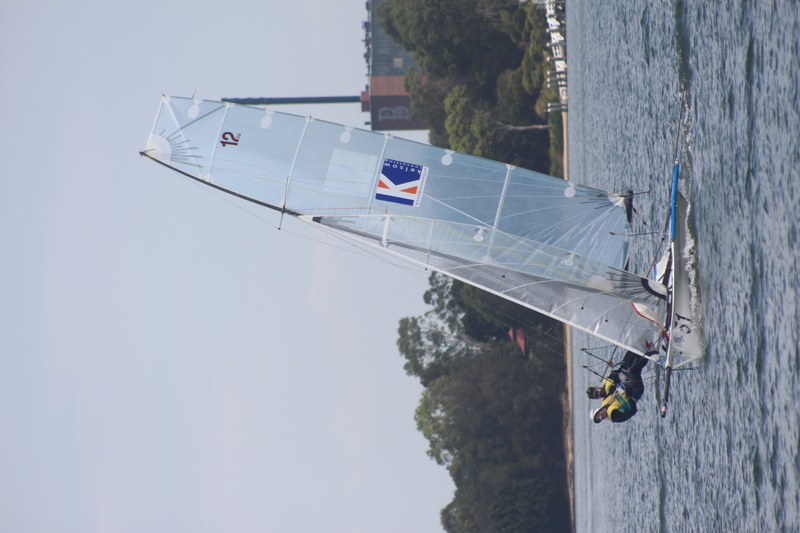 Once the kites were set Sydney Sailmakers extended the lead as the fleet fought for the podium positions. 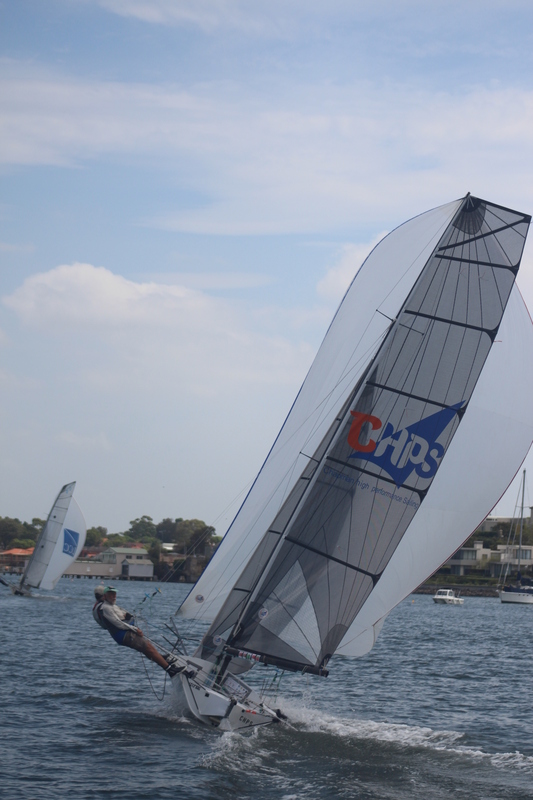 Havoc showing good speed with the big sails until a broken backstay ended the day early for them. Bigfoot Foot Custom Trapeze Harnesses, Geotherm and Lincoln Crowne crossed tacks and gybes entire way around the course. This time Lincoln Crowne coming out on top in the battle with Geotherm and showing excellent speed with their new big mainsail. Slippery When Wet (John Williams/ Zac Tatum) coming home in a solid 6th position is also showing good improvement having their first season together. Marty and Ian showed of their new purchase (Hempel) in the park but couldn’t connect the dots in time to make the race. They should be hitting the water in the next few weeks. This entry was posted in News, Race Reports and tagged Abbotsford on February 6, 2017 by skiffed_2.